Manufacturing and Trading of DPC Covered Aluminum or Copper Wire and Strips, Super Enameled Aluminum or Copper Wire etc. 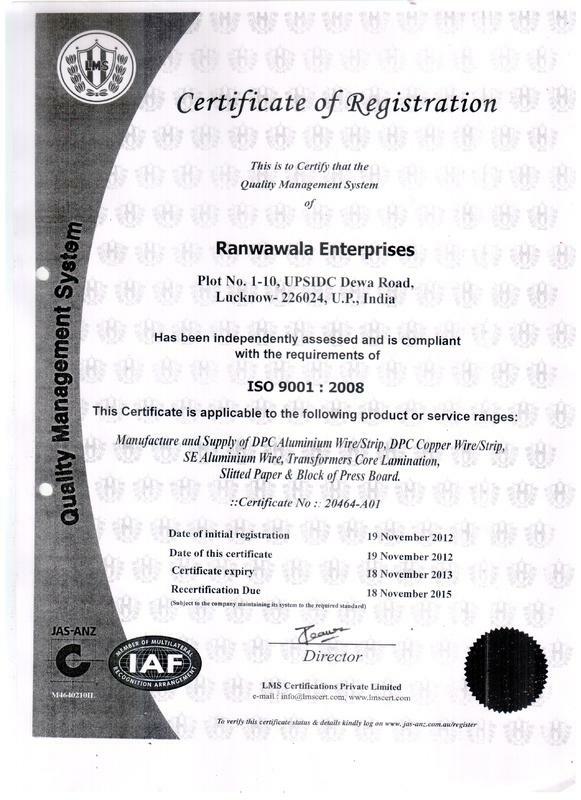 Established in the year, 2000, our company, Ranwawala Enterprises is engaged in the sphere of manufacturing an assortment of Electrical and Power Transformer Components. These are supplied to all over the country and are appreciated for their optimum finish quality and performance standards. The entire range is fabricated at our highly sophisticated manufacturing unit that is equipped with latest manufacturing machines, allowing us to develop the above-mentioned components with cutting edge technology. 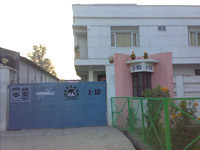 Our manufacturing unit is managed by highly qualified technocrats and experts, who ensure maximum utilization of our facilities. Our infrastructure also incorporates a modern quality testing facility that helps us in check these components on well defined industrial parameters. Being a client centric organization, we also ensure that the desired specifications of our clients are customized with perfection. All the business operations are guided by our Owner, Mr. Awadhesh K. Agrawal, who has rich industrial experience of the industry. 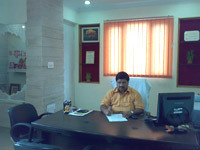 His sharp business acumen has helped us to execute our activities smoothly and effectively. We are an ISO 9001-2008 certified company, engaged in fabricating a wide range of Electrical and Power Transformer Components that is properly tested on well defined industry parameters at our modern quality testing unit. Since the inception of our company, we have been a quality conscious organization in order to gain credibility in the market. We offer a wide array of CRGO Sheets, CRGO Coils, CRGO Electrical Steel, CRGO For Distribution Transformer, CRGO For Power Transformer, Aluminium and Copper Wires, DPC Wires, Kraft Insulating Paper Roll and Insulating Films. The entire product range is manufactured with graded aluminum, copper, steel and other raw material that ensure excellent durability of the components. Further, we also conduct various tests to determine the quality of the offered sheets, coils and films to ensure in them optimum functionality standards. These components are widely used in electrical and electronic applications. Leveraging on our industrial experience, we are also capable of providing effective customized solutions to our clients to suit their requirements. Further, to ensure trouble free functioning, we also provide effective after sale services to our valued clients. We have developed a niche in the sphere of manufacturing an excellent range of Electrical and Power Transformer Components. There are various factors that allow us to have an edge over other competitors. This includes modern manufacturing facility, industry experience, cutting edge technology and experienced professionals. Being in this industry for more than 17 years, we have been able to understand current trends and demands of the market and hence, provide complete customization to our clients. Our customized components are supplied all over India and are used in various applications in assembling of Electrical Transformers. Due to our client centric approach, we have been able to attract a large number of clients from all over the nation. Clients are the prized possession for our company and we ensure that our clients are pleased with our services. We respect our clients for providing us an opportunity to serve them for so long. Being a client centric organization, we also provide effective repairing services ensuring trouble free functioning of our components. We have also adopted various payment modes such as Money transfer through bank, Cash and Demand Draft to ensure hassle free transaction. Further, we have also appointed a team of highly expert researchers who assist us in customizing our components as per the specifications, detailed by our clients.